A couple of nights in the cells isn’t so bad though – let’s start this round-up with some hard-hitting news from abroad. 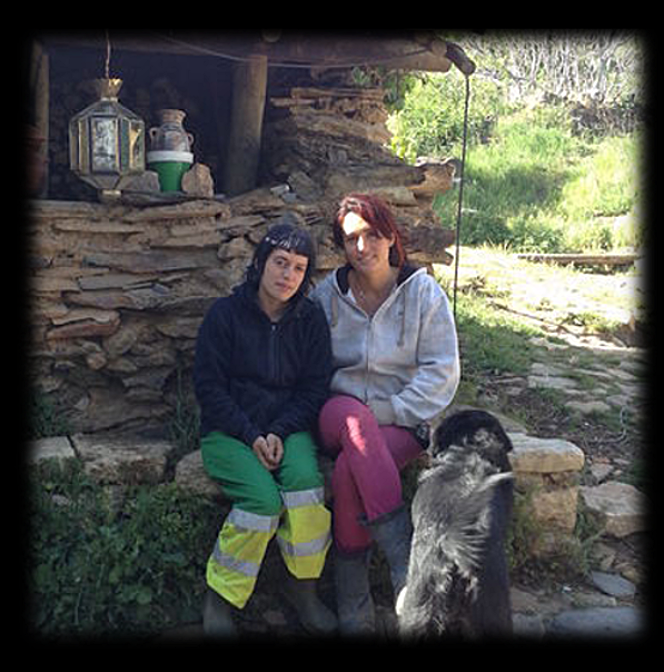 The Fraguas case in Spain. 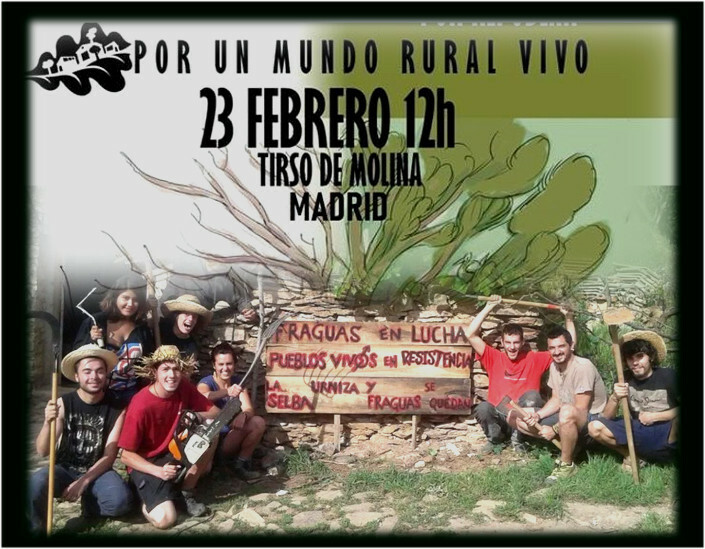 For those not aware of the situation, since 2013 a group of squatters calling themselves the Association of Rural Repopulation of Sierra Norte, more commonly Fraguas Revive, occupied an abandoned village in Guadalajara near Madrid. 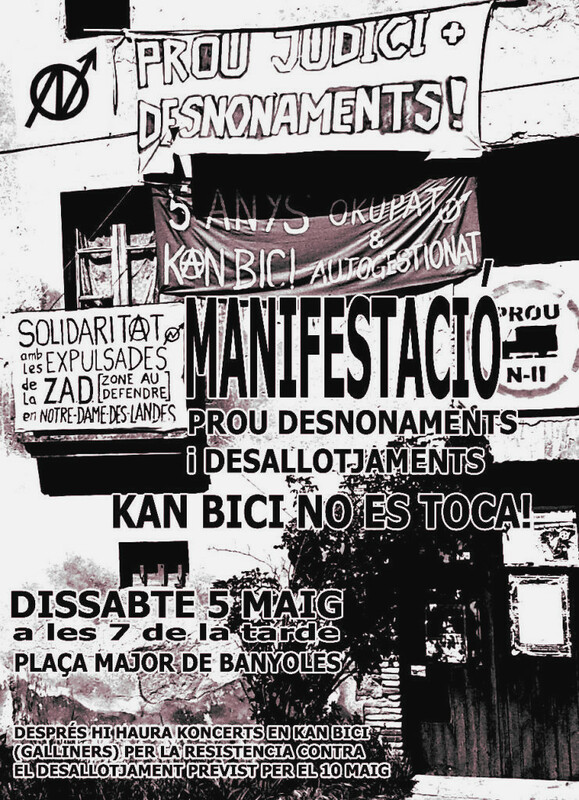 The intention was to breathe life back into the village that was left empty since the expropriation by the Franco regime, and to provide space for people to imagine and act out utopias of the future through self-organisation and sustainability. Unfortunately the municipal government of Guadalajara came down hard on the group, for daring to carve out their own destinies. Back in 2018 the provincial courts sentenced six of the people involved in the project to approximately 3,000 Euros in fines each, and an 18-month jail sentence, for the crime of usurping land from local authorities without permission. They immediately took this to the appeal courts, but unfortunately last month the court upheld the decision, and they will now have to serve their sentences. In addition they refuse to pay the costs of demolishing the buildings they have repaired, although this may also result in an extra nine months incarceration for non-payment. An impressive stance to take, and my non-existent hat goes off to them. 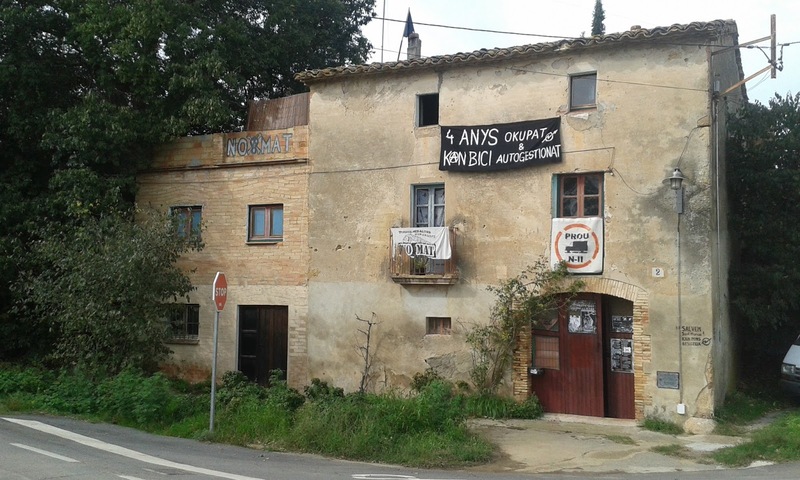 An interesting note is that the government utilised these laws on the basis that the village was now part of the Natural Park, so therefore couldn’t be considered a dwelling, and they were able to screw them with the serious charges rather than the more administrative process that tends to take place for squatting in Spain. Similarly there are regulations here in the UK about “royal” parks, and police are able to simply remove with force anyone they wish. 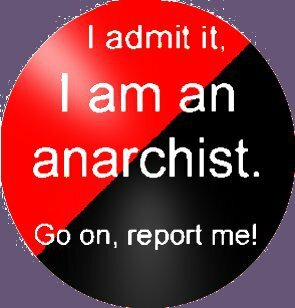 I have seen this abused by the Met Police to break in, beat up, and evict people squatting an abandoned caretaker’s in north London. There isn’t too much more to this analysis than just to say it’s funny that where parks and natures are supposed to be there for people to participate in and enjoy, and where the regulations are supposedly there to protect those notions, they are abused at the first opportunity to uphold social order. 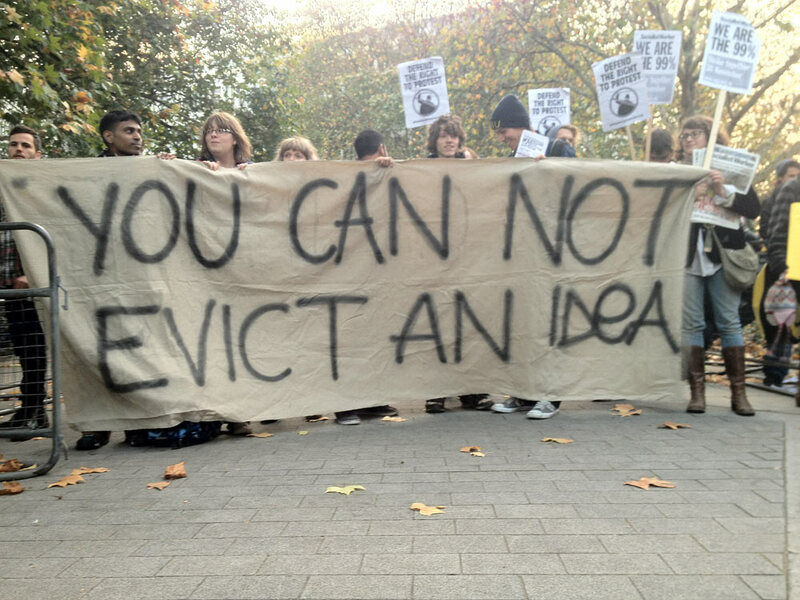 Further bad news, which is a running theme in this column as well as the squatting world in general, is that the eviction process of Grow Heathrow has finally begun. Started almost nine years ago in Sipson village on the outskirts of London, it is land that was supposed to be the site of the proposed new runway for Heathrow airport. Political protest, land reclamation, and communal living have been part of the project as it has evolved over the years. The plan to evict has been long fought in the courts, and has been muddied by the squatting of a second adjacent plot of land that is owned by a different owner, making the enforcing of any Possession Orders logistically very difficult. However the time has come that the owner of the original site, Imran Malik, wants it back. About 7.30am Tuesday (the evening standard reports 8:30am, but our local squat networks of course were on the blower much earlier about the situation – remember to sign up to the “NELSN” London phone network on 07575013111) the first High Court Enforcement bailiffs from the National Eviction Team arrived on the scene, and not long after they had gained access to the front half of the site. During the eviction Grow Heathrow got some unexpected support from local school children. Our hippy friends took to the tunnels and the tree-houses, with one person locking themselves to the turbine tower, and another going underground into the tunnels with food and water to last several days. Dig little mole, dig! 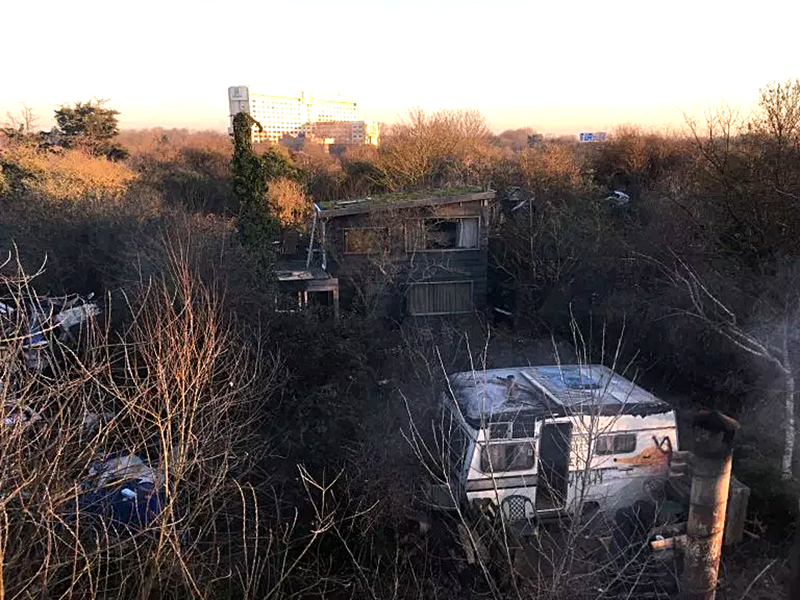 While the squatter up the tower has since been cut away, squatters from across London are making their way to support the Grow Heathrow crew as they remain in the second-half of the site, planning resistance, and of course the ninth birthday party in just few weekends’ time. See you there. The call is still out for people to join the resistance, the bailiffs are booked for up to two weeks to carry out the eviction, so anyone from London (or further) who has the time and energy feel free to go and get involved: Grow Heathrow, Vineries Close, West Drayton, UB7 0JH. Freedom spoke to a Grow Heathrow member today who said: “We want people to know we are still on the back lands! We have lost our kitchen, front garden, bike racks, art space and front guest cabin – and we will be rebuilding those on the back part of site over the coming weeks. Sticking with evictions, Asilo (the Asylum), longest-standing squat in Torino, Italy, said farewell on February 7th. 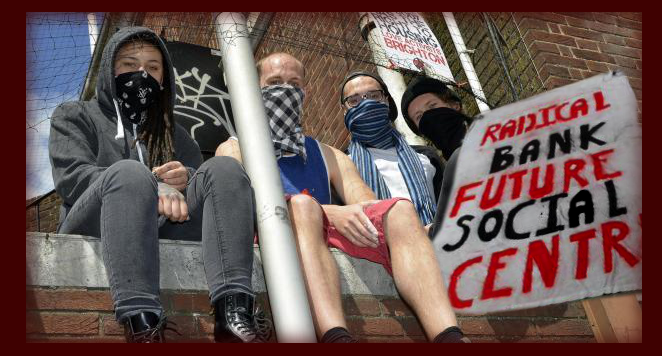 For almost 25 years it was a hub of radical and local organising. The premise for the break-in was the arrest of six people purported to be involved in explosive attacks against institutions involved in the detention and deportation of migrants. Disappointing to say the least that the fire brigade helped the police into the building, and then issued a condemnation notice. It’s always nice to think of the fire brigade as an essential and welcome public service, and there’s no need for them to be complicit in such an action. Boo. One bit of good news does exist however, in Eccles, Greater Manchester. In November a group of homeless people took over an abandoned NHS building and have turned it into a homeless centre, helping people to keep a roof over their head while seeking the support they need. They have since been taken to court by the NHS (see above for institutions that needn’t be complicit in upholding state repression), but were almost immediately after granted a stay on the execution of the Possession Order while they appeal. Your author doesn’t know the current state of the appeal, but as at the time of writing they were still occupying the building. A bit disjointed, this month’s letter is perhaps lacking in a cohesive theme, or particular analysis of things squatirical, but it is interesting to look at some of the squats that exist outside of the cities. Resistance, and organisation, is often different to that which I and others experience in the cities of abundant ephemeral squats. 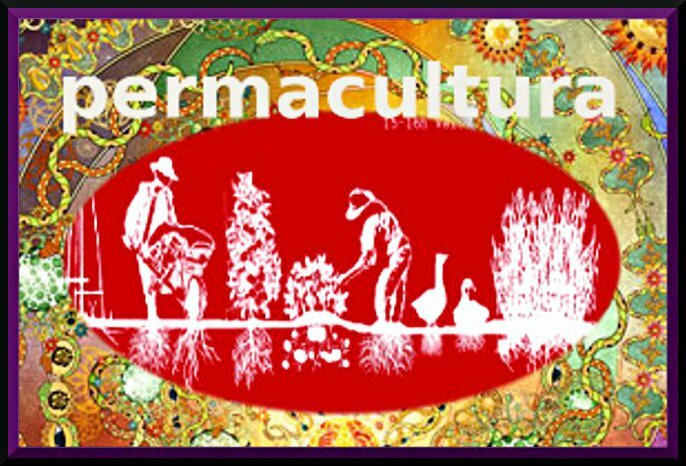 I certainly have found this to be the case, and found it to be eye-opening and valuable when visiting and participating in more rural resistances. Then there are many cases of indigenous occupations, that somewhat transcend the conventional understanding of the word squat, even if it indeed describes their legal status. From the water protectors occupying the pipelines at Standing Rock, to the slum villages of South Africa where groups like Abahlali baseMjondolo are organising local and indigenous to fight against evictions, and to Kenya, where villages without ownership are under threat of eviction from government forces at any time. 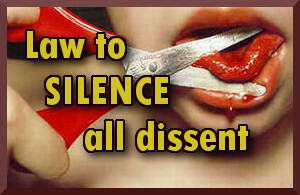 I won’t offer any attempts at humorous commentary on these situations, they exist in the reality of others’ experiences, but I am seeking to learn more about resistance across the globe, and implore others to do so too. 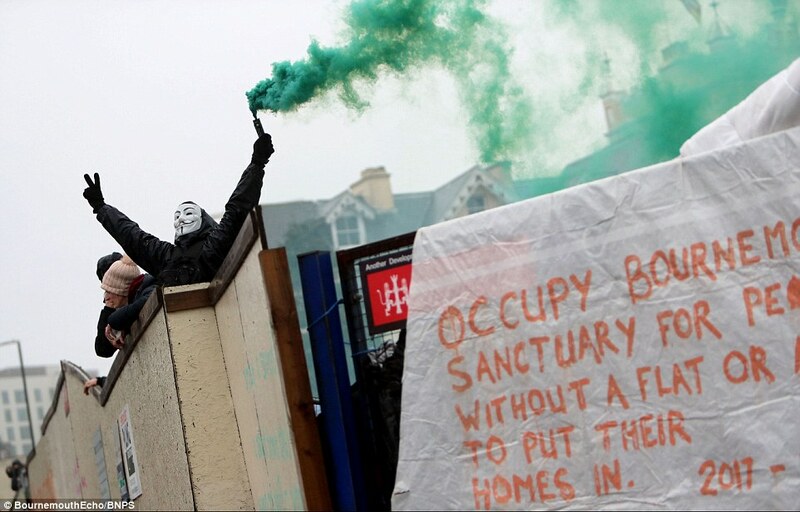 The world is fucked up, and as capitalism drives people further from feasible housing solutions, squatting, amongst other forms of resistance, becomes more important, if harder to actually live out. The opportunity to organise ourselves and take charge of our housing, our lives, exists in these spaces. We can’t give them up. 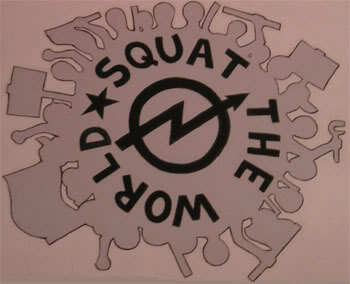 On that note, I’ll be looking to not give up my own squat as we face imminent eviction early next month. Keep your fingers crossed for us all and we’ll see you next time. Anarchists In the News If you walk up Laugavegur on a summer day, as you pass the gate that blocks downtown car traffic, you might notice that the cars are detoured down the impossibly small side street of Vatnsstígur. Amongst the few buildings on this one-block lane is a boarded-up house, the steps to its front door missing, the facade liberally decorated with half-assed graffiti. 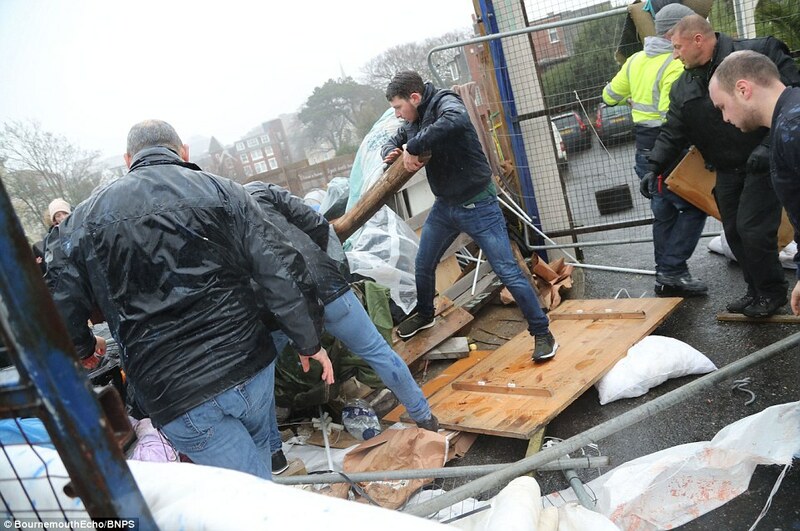 They are understood to be a mixture of homeless people and campaigners from the group Occupy Bournemouth, who were evicted after taking over the town hall in 2012. The largest squat and self-managed district in the Spanish state is in Gasteiz and is called Errekaleor and has at least 150 inhabitants. At the moment it is besieged by the Ertzaintza, the Basque police forces in the service of speculation and the Spanish State . 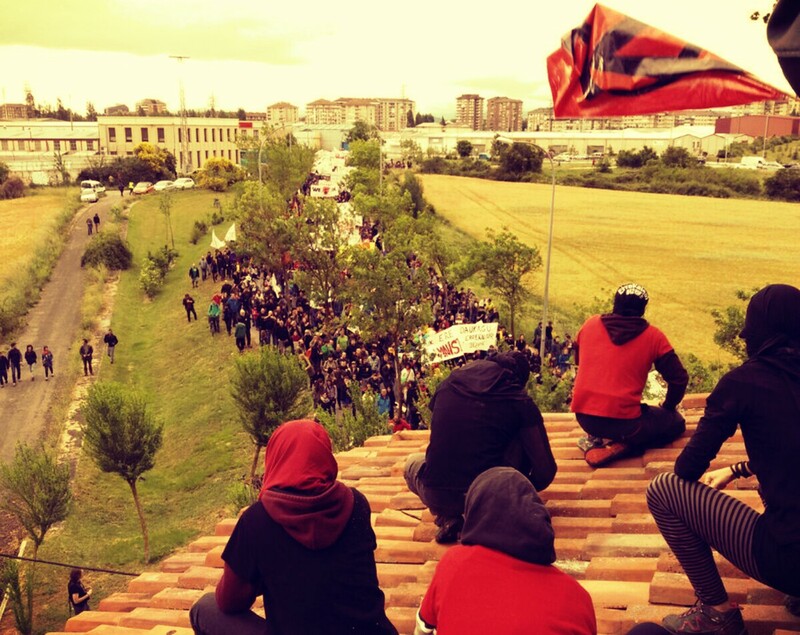 Over 10,000 people came out to defend the occupied anti-capitalist neighbourhood on June 3rd. Dozens were injured or arrested by riot police who dug up the street to cut electricity cables to the barrio. By Anonymous Contributor .. Errekaleor Bizirik is an occupied neighborhood at the edge of Vitoria-Gasteiz, Araba, in Euskal Herria (Basque Country). 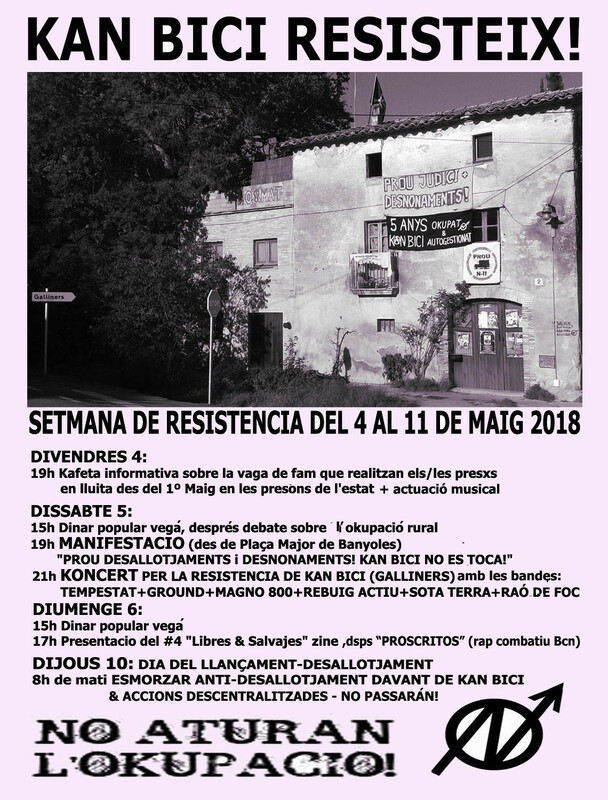 We are a project based on the principles of ‘autogestion’ (self-management or autonomy), consensus based decision making, feminism, anti-capitalism, and Basque cultural reinvigoration. sufficient economic resources to pay a rent and also lack properties. (note: the landlord of Kan Bici has at least 40!